The local moors and woodlands around Plockton offer great mountain biking directly from the village; a full days challenging ride can be had over the Lochalsh Peninsula without the need for the car at all! A short drive from Plockton are the world renowned mountain trails of Torridon, many rugged and rewarding trails on Skye, and numerous lesser known but equally spectacular remote mountain routes. There is something for everyone who wants to explore the outdoors by mountain bike. Lochalsh Peninsula. The terrain over the Lochalsh peninsula is steep, so a good level of fitness is probably required, but trails are largely double track or forest road, and are not excessively technical. Riders need to be prepared to slog uphill so as to gain the rewards of spectacular views over Skye, Kylerhea, Applecross, and the rush of fast swooping downhill singletrack sections. A map of these trails can be found HERE. Torridon. 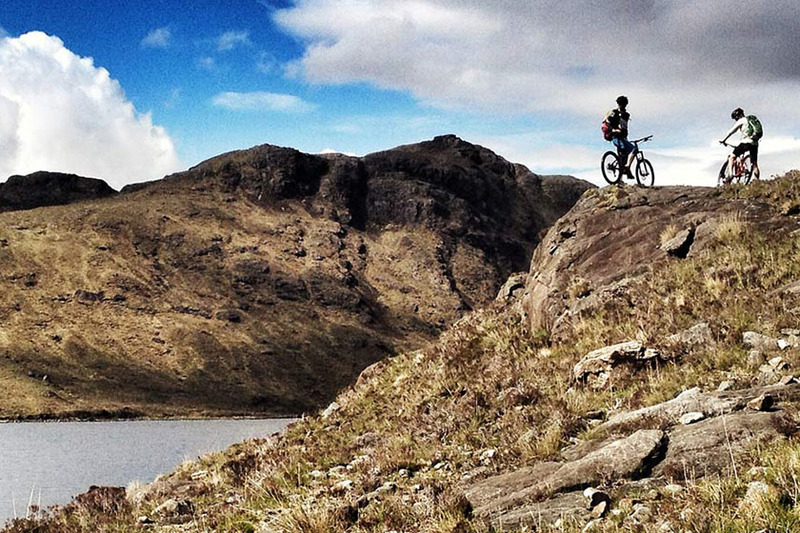 Torridon offers absolutely world class mountain biking; genuinely, people come from all over the world to ride here, and the best routes can be accessed from Coulags or Achnashellach in Glen Carron, just 30 minutes drive from Plockton. A number of loops are available, but be aware: all are long and very technically challenging – biking for experienced riders only, with high quality bikes. Skye. The popular riding routes on Skye is also generally technically challenging and are for experienced riders. Routes tend to shorter than in Torridon however, quickly taking you into remote and scenic mountain locations, such as Glen Sligachan – a great out and back to the south coast. A more leisurely, family friendly ride can be had around the fire roads of Glen Brittle forest. The roads around the area are rarely flat, so can be pretty challenging to ride. The main road to Skye and on to Portree tends to be quite narrow and busy, but get off this main highway and some beautiful road rides are available. In fact, the 18km ride from Stromeferry, via Plockton to Kyle is included in ‘Bike Scotland’s 40 Classic Highlands and Islands Routes’. The short loop from Plockton around Loch Lundie is also popular. 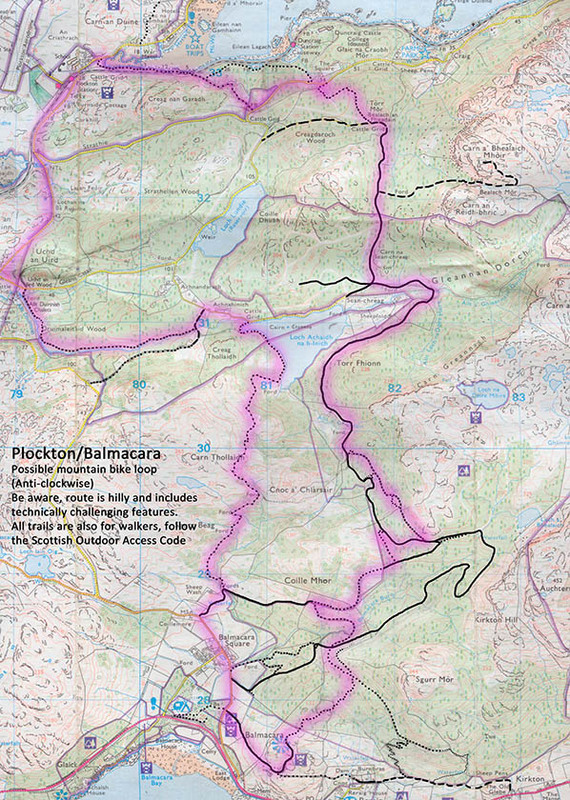 Plockton-Dornie-Glenelg-Kylerhea-Kyleakin-Plockton (76km/47mi). This route includes the hefty Mam Ratagan Pass, before swooping down to Glenelg and a nice break on the Kylerhea ferry (Easter to mid-October) before hitting a second punishing climb out of the glen and onto Skye, returning via the Skye Bridge. The biggie! The Bealach na Ba, the biggest road pass in the UK is visible from Plockton, but it’s a 25 mile slog from the village just to the bottom of the pass. The classic loop, over the Bealach to Applecross, round the coast to Shieldaig and back to the foot of the pass is 69km/43mi. You need a good pair of lungs for this one!